Most of the commercial companies like educational institutions required multiple computers for their users and having enough computers is very important to have their employee work to the fulles. If you own a small business, you may be interested in using one computers with multiple workplaces as an inexpensive way to expand your IT infrastructure with minimal investment. If you are, then IBIK is offering you a professional software "ASTER", which provides faster and less expensive way to create additional workplaces from one computer. ASTER program is affordable and very effective solution designed to utilize the computers resourses to the fullest by allowing multiple users to use the same computer in a non-interferring way. 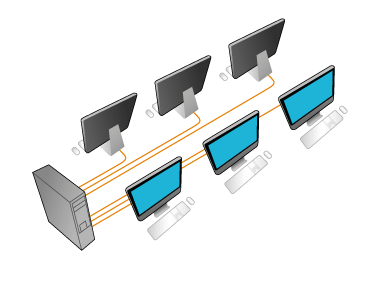 Once you have connected multiple monitors to one computer system, you can have an inexpensive way to use computer by reducing the number of system units as well as reduce the harful emition of radiation from the computers while significantly cutting down on energy consumption compare to individual computer systems. You do not need to buy full set of computer equipments, since ASTER allows you wot start computer with several workplaces on the basis of one system unit. You only need to purchase additional monitors, keyboards and mice. In addition, there is no need to setup a local network as each workplace have automatic access to all the resources available on the computer. All users can work simulatenously on same program or different programs without interrupting each other's work. If you need to deploy computers in classroom/library, offices and internet cafe. Then, it is enough to buy one computer and several monitors and keyboard/mice. On our website, you can download free trial version of ASTER software and use it and try out all the functions before you decide to purchase the license.